On Wednesday, March 17, at the Latitude 30 Lounge, we caught the scent of new talent all the way across the Atlantic. The night was hosted by a branch of the BBC dedicated to promoting up-and-coming performers and bands, BBC Introducing and PRS for Music Foundation. Through the support of BBC Introducing, unsigned artists get the chance to create, innovate, and perform music that might otherwise never see the light of the stage back home in Britain—much less at South by Southwest! BBC Introducing makes music discovery an egalitarian affair, and not just because the BBC is tax-supported by citizens of the United Kingdom. Every song uploaded to their website gets a listen from BBC radio producers and has the potential to be added to the BBC's roster of radio shows. After getting radio play or performing at one of BBC Introducing's concerts, including this SXSW show, the cream of the crop can add the accolade "BBC Music Artist" to their resumes and benefit from the exposure that gives them to music executives both in the UK and in countries abroad. Indiezone.TV grooved all night to the lively, fresh sound of these up-and-coming musicians before asking them about their origins, their style, and anything else we could glean before they hit it big. In keeping with the evening's theme, one of our youngest hosts held the interviewing reins. Watch these exciting new performers answer her questions and then check out their performance videos from the show! Little Simz is 21-year-old Simbi Ajikawo, and a rap emcee with roots in Lauryn Hill but plenty of success on her own, having been nominated for MOBO awards without being signed. She's released multiple mixtapes and this is already the second time she's played SXSW! There's a world tour coming for this lyricist, who the News Hub described as "gruff enough—and cool enough—to command attention on record without losing…her unique and potentially bankable sense of crossover appeal." At 16, this Irish singer/songwriter has already released two albums! 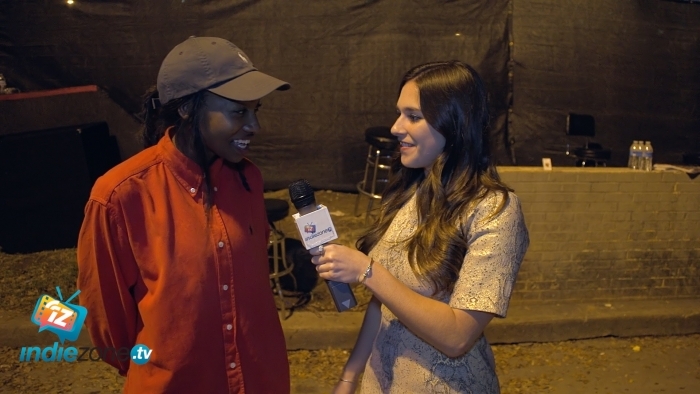 Soak, Bridie Monds-Watson's stage name, gives us the down-low on her SXSW performance and how her nerves in front of such a large audience actually gave her set a boost of energy! Despite the sometimes heavy subjects of her songs, Bridie performs with a joyful tenderness. Lucky for us, she plans to head back to the United States again soon. Gengahr debuted their catchy falsettos in the summer of 2014. Describing their sound has been a mesmerizing puzzle ever since, which is likely how this experimental group wants it. Synthpop might be the closest label, but each of their songs has its own unique combination of sounds, whether that is folk, art rock, or guitar-heavy melody. We speak with drummer Danny and guitarist Felix, two of the quartet, after their SXSW show about how they slowly formed their band and their plans for the rest of their Austin trip. Gengahr performs their single, "She's a Witch" at their SXSW show. We'll be back with more coverage of what went down at the British Embassy, SXSW's nickname for the Latitude 30 Lounge, soon.